Every minute you spend helping gives a minute of hope to those affected by breast cancer. Our organization is fueled by our awesome and dedicated volunteers! Join us and help fight breast cancer right here in our community. 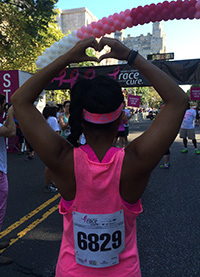 Please take a moment to fill the Komen Greater NYC Volunteer Application. We will reach out directly as opportunities become available. Contact Susan Jacobson, our volunteer coordinator at volunteer@komennyc.org or call 212-461-6198.